November was a month of growing facial hair, walking 60 miles over 3 days and writing novels. I’m personally glad to have participated in one of these feats. You are crazy and pretty amazing if you did all three. I love graphs. This chart helped me keep moving. 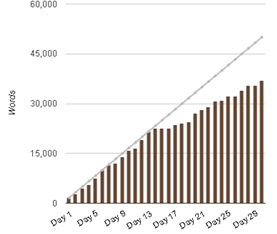 I enjoyed watching the bar creep upwards each day as I input the word count. I work well with a timer. After attending a Write In at the Ink Spot, an awesome writers workshop space in East Village, I learn I was the most productive and focused when I set a timer and had a goal in mind. 50 minutes for 500 words. I mostly averaged 10 words per minute (see above goal for calculation). That seems low, but referring to plot and character details, getting stuck on a word or changing scenes all cause delays. Writing at a quiet coffee-house, good. Writing at a noisy bar, not very productive. All seemingly obvious. I tried out various places to write including Rebecca’s in South Park, Lestat’s on Adam’s Ave, Claire de Lune in North Park, Whistle Stop in South Park, El Zarape in University Heights, in my bed, the couch, at work, and of course, in Balboa Park. Typing on a netbook can be hazardous to your health. I ended up going to the chiropractor weekly to adjust the kinks out of my neck from looking down at the computer. Characters can take over your story. On more than one occasion, my characters defied my predetermined plot. Sometimes I had to make corrective actions to ensure late parts weren’t compromised, but mostly, I just let them win. You have to just keep going. I like to word smith and edit as I go. I learned that to get the word count up, you have to just let it go and just know that you will have to come back to it later. The main thing is to get the concept on paper. And by no means am I done. I’m about three-fourth complete according to my outline. I plan to continue writing everyday until the first draft of my story is done. Then there is the editing, reviewing and all of the work it takes to actually get it published. I don’t even want to start thinking about any of that until I at least have a completed first draft. I have started a list of people who want to help with editing, so if you are interested, please leave a comment or shoot me an email. Since this is all new to me, I appreciate any help offered. Lastly, I want to thank my husband. I couldn’t have done any of this without his support, including spending extra time playing with our son allowing me more time to write. For this, I am truly thankful. You’re right: A fine effort indeed. But you should have used Comic Sans.